SAN FRANCISCO (KGO) -- Officials are warning the public to be careful after surveillance video revealed a suspect pickpocketing a man holding a baby on a Muni bus on January 5 in San Francisco. 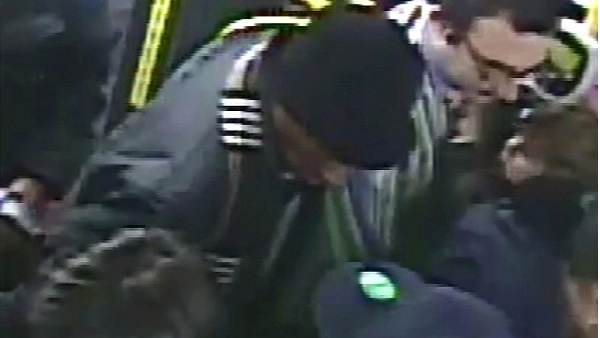 In the video, the suspect is seen wearing a black hat and standing behind the man in a very crowded bus. First the suspect is seen facing the victim, then he turns his back to the man and that's when he allegedly slipped his hand in the victim's back pocket and took his wallet. "He was carrying for his children. It made him vulnerable through no fault of his own. But the suspect targeted him on that, especially since it was crowded, seeing that he was attending to the children. It made it easy for him to slip in and be able to grab the wallet," San Francisco Police Department Ofc. Giselle Talkoff said. Officials said the suspect then got off the bus and nothing else was taken from the victim. The public is being advised to keep their wallet in front pockets and keep bags and purses in front of their chest, not on your back. San Francisco police are asking for help identifying the pickpocketing suspect.